A tiny, irreverent little division of This 'n That Films. We put together Fat Dachshund Films to explore our other creative avenues. While we intend to have This 'n That Films continue to create award winning documentaries that entertain and educate, Fat Dachshund Films is strictly for fun. We'll create projects here that don't fit into our mainstream catalog. Fat Dachshund Films may use images or language that is inappropriate for a This 'n That Films project. *%&#@! GPS is a short short film about an elderly woman driver who talks back to her GPS. She does not seem at all surprised when the GPS starts talking back to her. However, this GPS talks like a sailor! *%&#@! GPS had its world theatrical premiere at the Hamburg International Short Film Festival on May 31, 2016. *%&#@! 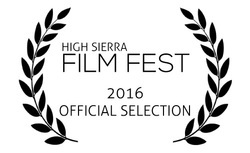 GPS was selected as a finalist at the High Sierra Film Festival in Reno, Nevada. Watch on Amazon Prime for FREE! THE SANTA TRUST - A young girl has a special Christmas as she discovers a special Santa Claus. We're pleased that we are a finalist in the Oaxaca Mexico Filmfest short script competition, in October 2017. This qualification also makes us eligible for their Global Script Challenge. Status: Script is complete. Seeking funding. "THE SANTA TRUST is a wonderful Christmas story that while taking a look at the truth behind Santa, doesn’t negate the magic but rather reaffirms it as the figure of Santa becomes an ideal and therefore even more magical." NOBODY'S PERFECT - A man in his early sixties is encouraged to go dating again after the death of his wife. SUPERPOWERS - A birthday present results in special powers for our senior. RIGHT, SAID FRED. Fred lives in one of those over 55 communities and enjoys going to the library at the clubhouse to read the morning paper and say hello to his friends and neighbors. "Fred is one guy that really gets good use out of all these facilities." One neighbor is heard to say. Until one day, things go awry. Status: Retired. Bart Williams, one of our collaborators and a dear friend came up with this premise. Bart would have played the Grand Wizard. With the death of Bart in 2016 we feel we cannot make this film. We leave the idea of it as a tribute to our friend and colleague.